Glister multi-action toothpaste gently removes plaque and discoloration from teeth while effectively fighting against cavities. Glister infuses the confidence of fresh breath and sparkling white teeth with regular brushing. A million dollar smile begins with the revolutionary Glister® Multi-Action Toothpaste. It contains Sylodent, a polishing agent which effectively polishes & whitens your teeth without excessive abrasion while its unique formulation fights cavities and removes plaque. 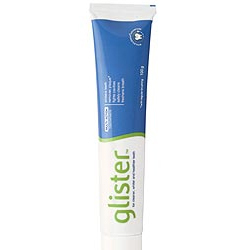 Glister Toothpaste for Cleaner, Whiter and Healthier teeth. Multi- Action Toothpaste: Whitens teeth; Fights Cavities; Removes Plaque; Freshens Breath; Promotes Remineralization. All with regular brushing. Great for the whole family. Shri Rama Madan Pvt. Ltd.
A million dollar smile begins with the revolutionary Glister® Multi-Action Toothpaste. Glister Toothpaste A million dollar smile begins with the revolutionary Glister Multi-Action Toothpaste. It contains Sylodent, a polishing agent which effectively polishes & whitens your teeth without excessive abrasion while its unique formulation fights cavities and removes plaque. It contains REMINACTTM Advantage that helps redeposit essential minerals back onto the enamel to make teeth stronger and more resistant to decay. Worlds best toothpaste for young one's and adults too. 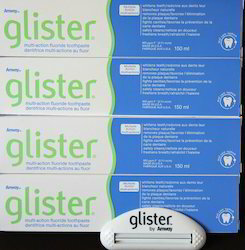 So just dont think of any other tooth paste go for glister and keep your gums and your teeth healthy and germ free.